My old friend and sourdough guru Yoke Mardewi-Caddy is having more classes. I can heartily recommend them. That’s where I learned the art of sourdough breadmaking. Here’s the information. Oh, by the way, the classes are in Perth, Western Australia. If you live on the East Coast, it’s still well worth a fly over. The skills you learn will keep you well sourdoughed for years to come. 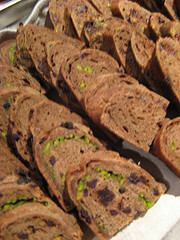 Check out her chocolate, sour cherry, pistachio and cranberry sourdough loaves below. The BEGINNERS’ ORGANIC SOURDOUGH BREADMAKING CLASS with YOKE. You may also like to have a look at this link for more information about her sourdough bread, and also the Summer 07 / Dec 07 issue of SPICE magazine. And, you will make your very own sourdough bread-dough to take home you will also take home my sourdough culture, plus organic/biodynamic flours to start off your breadmaking adventure at home. Let Yoke know if you have a particular dietary requirement or food allergy. Phone Yoke on 0412 272327 or email her on ycaddy@highway1.com.au if you would like to make a booking or have any queries. Yoke looks forward to meeting you!